075: Bearer of Bad News – Please Forgive Me!!! 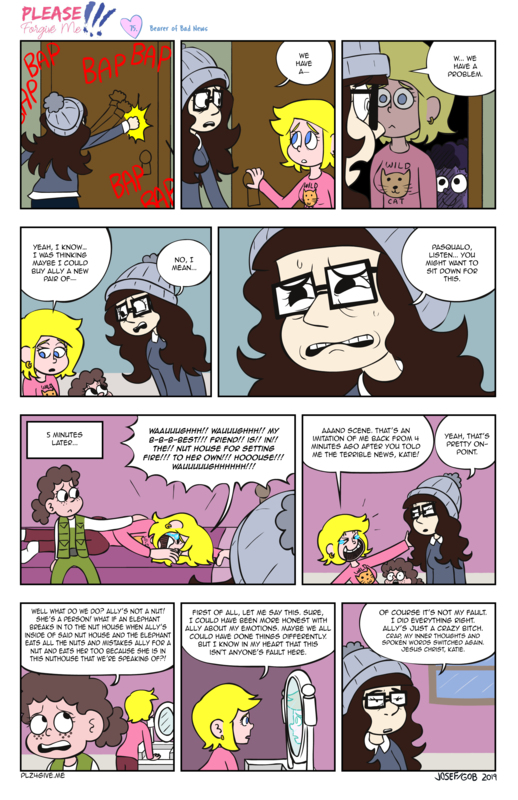 Chapter Five: Ally Goes to the Funny House - "075: Bearer of Bad News"
It’s sad that I relate to Katie this much. Better elephants than Rhinos, amirite? I just realized. It Hurts had Tubsy go to prison. Now Ally’s going to an asylum. You wouldn’t be planning anything for the 100th comic, would you, Gobolatula? Nope. It’ll be a regular update. Not sure what’ll happen in that comic but it’ll probably be fun. Josef and I don’t wanna repeat ourselves. It’s doubtful that anything “apocalyptic” or anything that level of big and crazy will happen in PFM. There’ll be drama and excitement but it’ll be more grounded. I would offer you a peach if they were in season. Oh boy, everyone’s starting to have a mental breakdown! Now they can keep Ally company and help each other out of their straitjackets! Also is that some green I see in that mirror? I think you accidentally a word in the ninth panel there, Josef and/or Gob. Fixed! Thank you! And that was me, by the way. My bad!